450 pages | 131 B/W Illus. 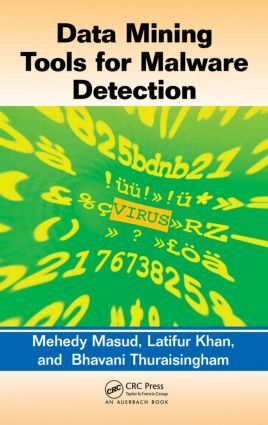 Although the use of data mining for security and malware detection is quickly on the rise, most books on the subject provide high-level theoretical discussions to the near exclusion of the practical aspects. Breaking the mold, Data Mining Tools for Malware Detection provides a step-by-step breakdown of how to develop data mining tools for malware detection. Integrating theory with practical techniques and experimental results, it focuses on malware detection applications for email worms, malicious code, remote exploits, and botnets. The authors describe the systems they have designed and developed: email worm detection using data mining, a scalable multi-level feature extraction technique to detect malicious executables, detecting remote exploits using data mining, and flow-based identification of botnet traffic by mining multiple log files. For each of these tools, they detail the system architecture, algorithms, performance results, and limitations. From algorithms to experimental results, this is one of the few books that will be equally valuable to those in industry, government, and academia. It will help technologists decide which tools to select for specific applications, managers will learn how to determine whether or not to proceed with a data mining project, and developers will find innovative alternative designs for a range of applications. Mehedy Masud is a postdoctoral fellow at the University of Texas at Dallas (UTD), where he earned his PhD in computer science in December 2009. He has published in premier journals and conferences, including IEEE Transactions on Knowledge and Data Engineering and the IEEE Data Mining Conference. He will be appointed as a research assistant professor at UTD in Fall 2012. Masud’s research projects include reactively adaptive malware, data mining for detecting malicious executables, botnet, and remote exploits, and cloud data mining. He has a patent pending on stream mining for novel class detection. Bhavani Thuraisingham joined the University of Texas at Dallas (UTD) in October 2004 as a professor of computer science and director of the Cyber Security Research Center in the Erik Jonsson School of Engineering and Computer Science and is currently the Louis Beecherl Jr. Distinguished Professor. She is an elected Fellow of three professional organizations: the IEEE (Institute for Electrical and Electronics Engineers), the AAAS (American Association for the Advancement of Science), and the BCS (British Computer Society) for her work in data security. She received the IEEE Computer Society’s prestigious 1997 Technical Achievement Award for "outstanding and innovative contributions to secure data management." Prior to joining UTD, Thuraisingham worked for the MITRE Corporation for 16 years, which included an IPA (Intergovernmental Personnel Act) at the National Science Foundation as Program Director for Data and Applications Security. Her work in information security and information management has resulted in more than 100 journal articles, more than 200 refereed conference papers, more than 90 keynote addresses, and 3 U.S. patents. She is the author of ten books in data management, data mining, and data security.